Galleria Lorcan O’Neill Roma is pleased to present Unitxt Mirrored, an audio-visual installation by Carsten Nicolai created especially for the exhibition space of via della Lungara. This is the first collaboration between the German artist and Galleria Lorcan O'Neill Roma. The project, which occupies the entire room, is meant to be viewed from the outside: standing before the glass showcase, one experiences the different visual and sound components of the work from a fixed point of view. The project makes reference to the audio-visual language encoded in UniTxt, a sound piece which Nicolai produced in 2008 under the pseudonym of Alva Noto for the record label raster-noton. The title Unitxt can be read as unit extended referring to a unit of a rhythmic grid or universal text referring to a universal language (as for example mathematics is, with its units, constants and measurements), which is in turn translated into words or the codes of sound itself. The visual component consists in the projection of colour horizontal lines, always shifting, and occupies the entirety of the front wall; the projection is based on the real-time manipulation / modulation of soft- and hardware-generated patterns by an audio signal. The projection thus responds to and in encoded by sound. Hence the resulting image constantly changes without recurrence. A further dimension of the work is created by the use of mirrors placed along the side walls of the space. The mirrors act as reflective structures by which the projection replicates and extends beyond the physical walls of the space. Hence the title mirrored. Sound, which is produced chronologically first, is translated in the light projection, and both sound and visuals are essential to the work in equal measure. The work with its composite nature reflects the artist's double identity as composer and visual artist. Carsten Nicolai is interested in experimenting with chance and its role in determining biological processes or creative processes, in a continuous search for the structural principles at the source of images and forms – which on their turn gain their significance only when they become real and perceivable. Science is one of the primary sources of inspiration of his work; Nicolai works with models which are similar to those used by scientists. For him they represent interpretive grids which can help us to better understand the world we experience. Art though is different from science in that we don’t have the possibility to produce a demonstration of the result, and experimentation can only be a constant search toward the construction of an explanatory model which needs to be demonstrated, and perhaps will never be. The value of the creative process consists for Nicolai in activating a process which creates and discovers connections and relationships between things. Art is a complex way of thinking and expressing concepts, the most elaborate way to manifest life; without contradicting the fact that his work is ultimately based on simple and essential principles, his work is open to philosophical, scientific and historical references and sources. In addition to the installation in via della Lungara, a group of new works on paper will be displayed in the gallery. 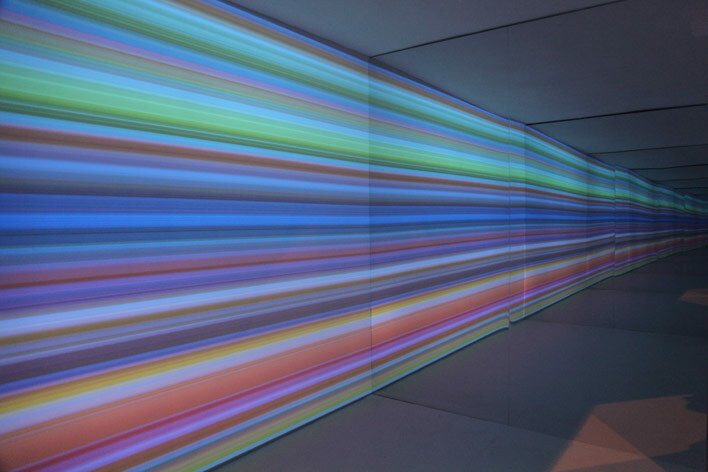 These works relate to the installation Unitxt Mirrored closely: they are a series of unique pieces that capture a specific and unique moment of the installation, freezing an unrepeatable moment of the projection of colored horizontal lines which are determined by the codification of sound in the installation. Carsten Nicolai was born in 1965 in Karl-Marx-Stadt, and now works and lives in Berlin. He has participated to Documenta X and the 49th and 50th Biennale d’Arte di Venezia; he has had retrospectives at the Schirn Kunstalle in Frankfurt and at the Neue Nationalgalerie of Berlin in 2005, and in 2011 at the Contemporary Art Center in Vilnius. Carsten Nicolai works with Eigen + Art gallery in Berlin and Leipzig, and with the Pace gallery in New York. For years now he has been experimenting with sound under the pseudonym Alva Noto, and owns a very active recording label: Raster Noton. Nicolai has presented his audio-visual works at the Solomon R. Guggenheim Museum in New York, the San Francisco Museum of Modern Art, the Centre Pompidou in Paris, the Kunsthaus in Graz and the Tate Modern of London.